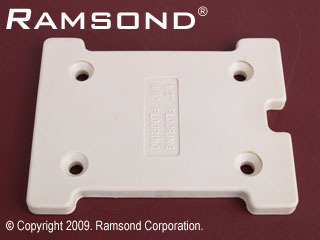 Ramsond ® has become a recognized name for the quality and durability of its products. 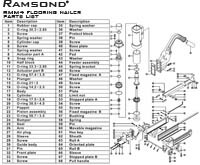 The Ramsond RMM series 2-IN-1 flooring stapler & cleat nailer combination is another lasting testament to the recognition that Ramsond tools now enjoy. 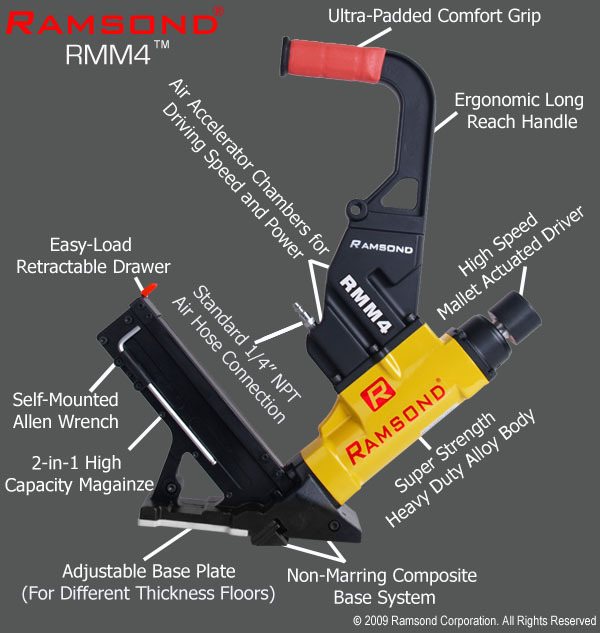 The Ramsond RMM series 2-in-1 flooring stapler/nailer has become the preferred choice of professional flooring installers as well as the do-it-yourself consumers. It is one of the best selling flooring guns in North America. 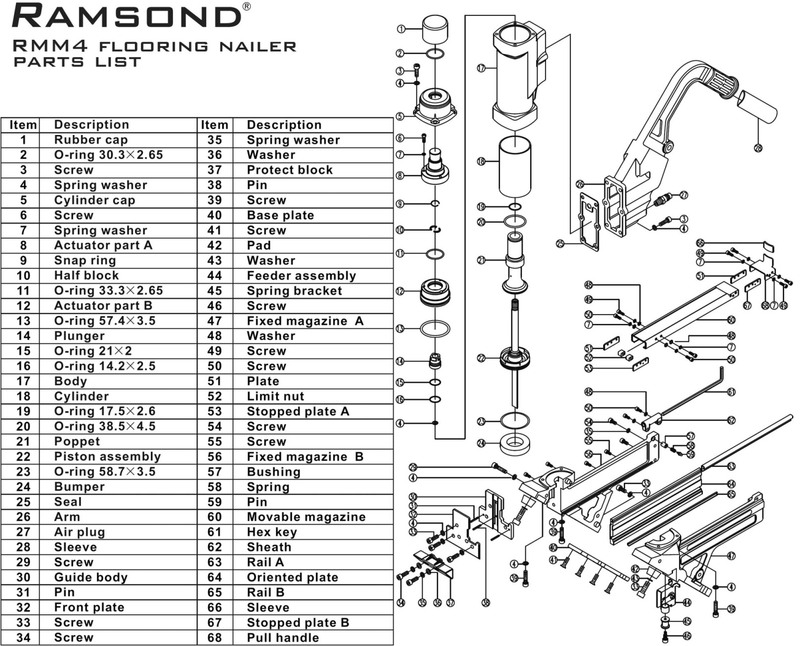 With over 30,000 units sold in North America, the RAMSOND RMM series, patented combination 2-in-1 hardwood cleat nailer and stapler is an engineering marvel. It shoots both cleat nails and staples, without the need to change magazine. It shoots standard 15.5 and 16 gauge staples ranging from 1 to 2 inches, and "L" cleats ranging from 1-1/2" to 2". These standard sized staples and cleats are readily available at any hardware store. The 2-in-1 magazine has a capacity of 100 staples/cleats. It is highly durable and contractor/industrial quality, yet light weight and agile. The body of this gun is constructed of durable die-cast alloy for job site durability and low weight. It comes with an extra-wide composite non-marring base plate for added stability and protection against scratches to the flooring surface. It provides a conveniently long reach handle with an ultra-padded cushioned grip for balance and optimal operating comfort, stability and safety. Internally, the driver blade is constructed of a very tough heat treated and hardened steel. The composite base plate is designed to allow the user to drive fasteners much faster and closer to the wall while protecting the flooring surface from marring. This ergonomically designed multifunctional tool is manufactured under the strict ISO guidelines for quality control. With over 30,000 RMM's sold, this product has become a symbol for reliability and durability. 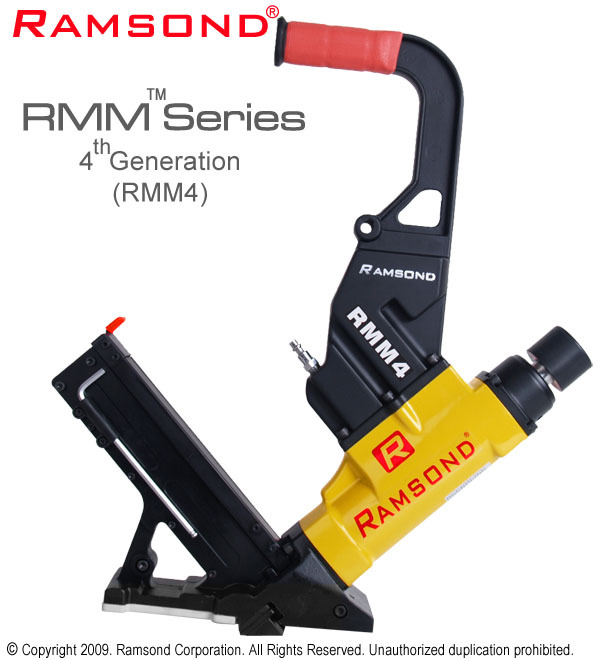 The 4th generation of Ramsond RMM series is now designated as RMM4. 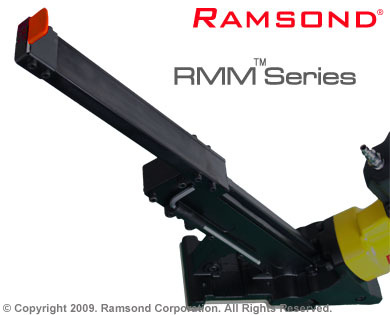 The RMM4 supercedes the previously popular Ramsond RMM3 series. RMM4, introduced in 2009, now features a redesigned, more ergonomic handle. Additionally, the high impact components, including the driver-blade of the RMM4 are now subjected to a new, high-tech and proprietary heat treatment process which substantially adds to this tool's longevity. 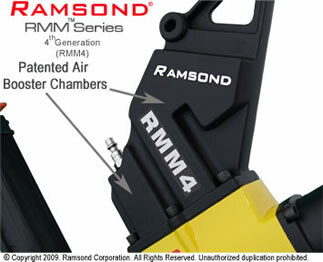 Ramsond RMM operates by using compressed air (60-120 psi). It is equipped with a standard 1/4" NPT air inlet. Simply attach the air hose from the compressor to the air inlet. Once attached, rest the nose of the machine squarely against the work surface. The direction and angle of the staple is automatically aligned for a perfect fastener penetration. Then it only requires a slight strike of the mallet upon the actuator and the cleat nail or staple is shot through the flooring at the proper angle and penetration. Virtually all conventional flooring nailers/staplers store compressed air within the body of the tool. Upon mallet strike, the air reserved in the body of the tool is then released and drives the blade, which shoots the fastener. Unlike these conventional models, the Ramsond RMM is additionally equipped with two patented air acceleration/booster chambers in the handle. So, in addition to the storage of compressed air inside its body, the RMM's two booster air chambers continuously store compressed air and provide added driving force and speed. By constantly storing extra compressed air, these sealed chambers ensure that the fasteners shoot with sufficient force for perfect penetration in the flooring surface. The booster chambers also accommodate quicker retraction of the actuator and blade when compared with conventional units. As a result, installation can be done at a much faster rate. This is another reason that the RMM has become the preferred choice of many professional installers. 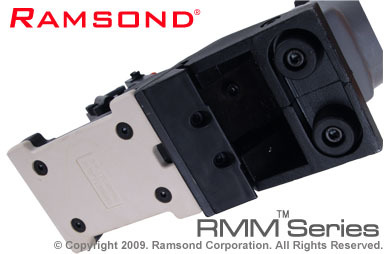 Ramsond RMM4's Patented 2-in-1 magazine and driver system accommodates the use of both staples and "L" cleats, without the need to change magazines. The fastener loading is also fast (less tan 10 seconds). Simply pull the magazine drawer back; drop in the fasteners and release the drawer. Please note that we do not carry these fasteners. However, these fasteners are standard in size and are readily available at all major hardware stores. RMM4's non-marring base system is equipped with two composite disks in the front, a middle guide and a rear nylon derivative base plate. The combination of these three mechanisms ensure that the surface of the hardwood flooring is not marred or damaged during installation. They also provide for perfect balancing of the tool and optimal positioning against the work surface for faster and more accurate installation process. The RMM series is suitable for virtually all thickness of hardwood flooring (1/2",5/8", 3/4", 25/32"). It comes with two nylon composite base plates. One is installed on the unit. The other one is included in the carrying case. Simply, install the appropriate base plate for your application. The changing of base plates is very easy. It requires the removal of 4 bolts (Allen Wrench Provided). Your safety is our number one priority. 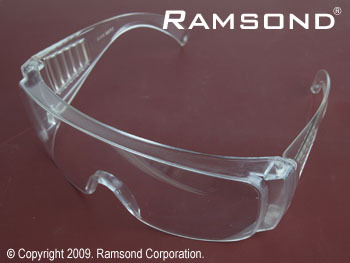 The RMM package includes a set of high quality ANSI* certified protective eye goggles. While working with any air tool, flying debris may cause injury to your eyes. As such, We recommend that you protect your eyes during any type of work with construction or industrial equipment/tools. 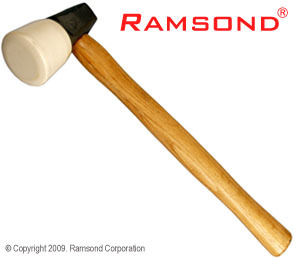 To further complete the set, each Ramsond RMM series comes with a mallet. On one end this mallet has rubber and the other end cast iron steel. The wood handle is clear lacquer finished to prevent splinters. It weighs approximately 2.5 lbs. The RMM4 package also comes with a free bottle of oil, 4 allen wrenches (includes the 1 installed on magazine), internal key/wrench and a complete o-ring kit. The RMM series flooring nailer/stapler, along with all accessories and its tools are incased in a rugged and handsome blow mold carrying case. The carrying case is engineered and manufactured to perfectly and securely house all components. RMM series flooring nailer/stapler has a proven record of reliability, quality and durability. With over 30,000 units sold in North America, this rugged tool has established itself as a premier tool for flooring and a preferred one among professional flooring installers. We DO NOT sell refurbished or reconditioned units under any circumstance. We also DO NOT sell units that we do not carry in stock. Each Ramsond RMM flooring nailer/stapler is guaranteed to be BRAND NEW in original factory packaging and available IN STOCK. 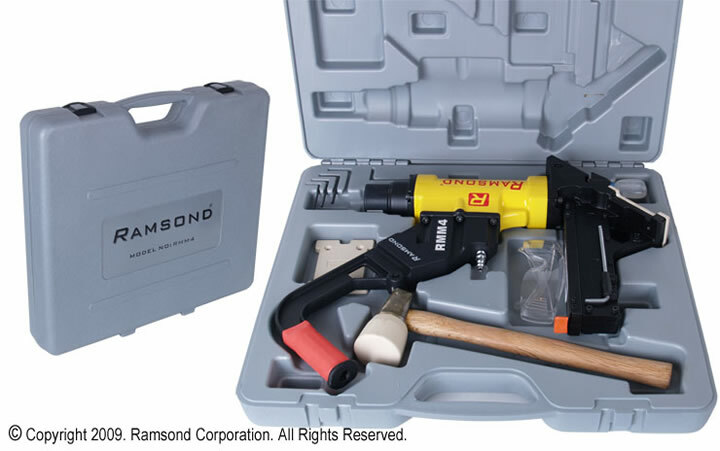 When you purchase your Ramsond RMM flooring nailer/stapler here, your investment is protected. We employ the best packaging techniques so your order arrives in perfect condition. All orders are shipped within 1-2 business days of receipt of payment. Each Ramsond RMM flooring stapler/nailer comes with a 1 year Limited Warranty covering both parts and labor (at our designated service center). We maintain a constant stock of all components and replacement parts. During the term of the warranty, should you require service, simply return your tool to one of our service facilities. Your tool will then be repaired or serviced promptly and returned to you. This is indeed the best warranty available as compared with other would-be competitors who simply provide a parts only warranty for knock off or no name brands. Furthermore, we have knowledgeable and qualified technical and service personnel on staff available to address any of your technical questions. Please email or call us and we will promptly address any of your questions. ran over 500 sq feet tool worked flawlessly drew flooring up tite no complaints at all buy it !!!! 5 years and still going strong. Decided on this after days of research on the internet. Quality is second to none and much less expensive than Bostitch (at least the one I bought). The molded carry case keeps it clean and all together. Love the fact that it came with spare set of O-rings although I've yet to replace them. Kinda worried they may dry rot before I get to use them. Lol. Only wish they had a ''wide'' foot like Bostitch offers. Other than that, don't be afraid to get this one. You won't be disappointed.